Essie Summer Shades, Comparisons, and Black & White Glitter toppers! Hi lacqueristas! Have you heard that I announced the winner of my most recent giveaway? Check it out to see if you're the lucky winner! Speaking of the giveaway, one of the questions I had for you all was what your favorite type of post was! A lot of people said swatch posts and several people mentioned that they like comparison posts. Today, I've got both of those rolled into one! I started out with two coats of of "The More the Merrier" and waited for it to dry. Then I used a cosmetic sponge to apply a thin coat of "Naughty Nautical" about half way down the tip of the nail. When that coat dried I added a second coat on the top quarter of the nail and then lastly I dabbed a third coat on just the tips. "The More the Merrier" is a creme while "Naughty Nautical" has some silver shimmer to it, however I think that because I applied such thin coats of "Naughty Nautical", not much of it translated on to the nail. 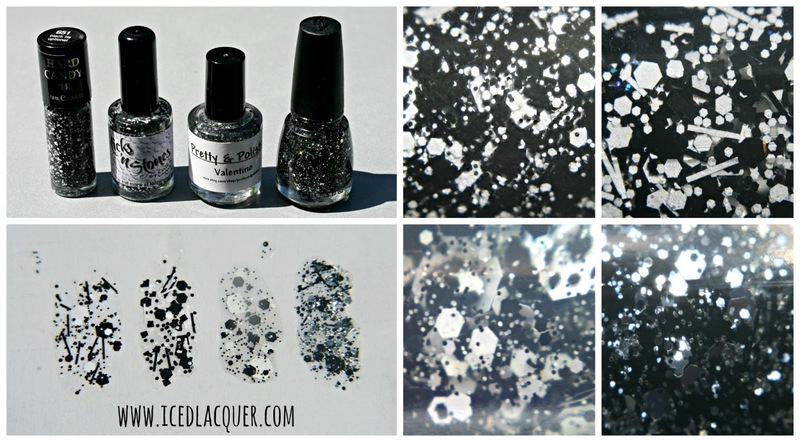 On top of my gradient, I added one coat of Hard Candy "Black Tie Optional" which is a clear based glitter filled with black and white matte glitters in several sizes of hexes as well as some black bars. This was my first time using "Black Tie Optional" and I found coverage and application to be great! Not too sparse and not too thick! I got plenty of shape and size variety with each dip. Here's a shot of it in the shade because the previous sunny shots were making the colors look SUPER bright! Not that that's a bad thing! And lastly here are some comparisons for you! Above I've got four different black and white (and silver?) glitter toppers that I own. Hard Candy "Black Tie Optional" - Four different sizes of matte black and white hexes along with black bar glitter. Cover Band "Sticks n Stones" - Three different sizes (it's lacking the tiny hexes that "Black Tie Optional" has) of matte black and white hexes, black squares, black AND white bars, and lastly some iridescent tiny glitters. China Glaze "Glitz n Pieces" - Instead of white, this polish has silver metallic hexes in several sizes along with the matte black hexes and bars. I figured I'd throw it in because it's similar enough! This one is definitely is the most dense. This comparison shows some lower priced dupes for each of these shades. 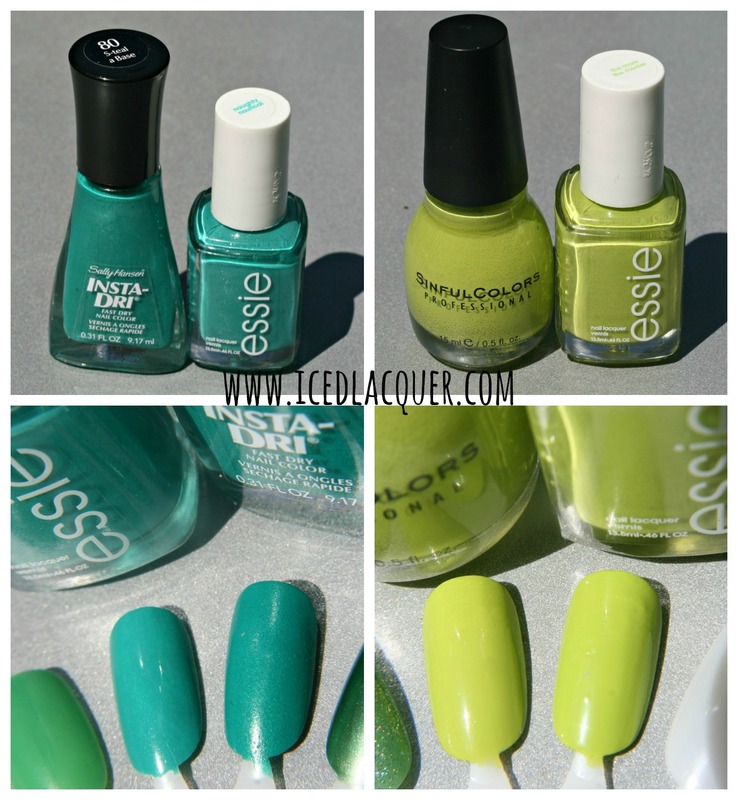 Bottom left picture: Sally Hansen "S-teal a Base" (on the swatch wheel, the Essie is on the left and the Sally Hansen is on the right) - By far one of my favorite polishes of all time. This has been on my toes non-stop for at least the last month. I even have a backup bottle of it. 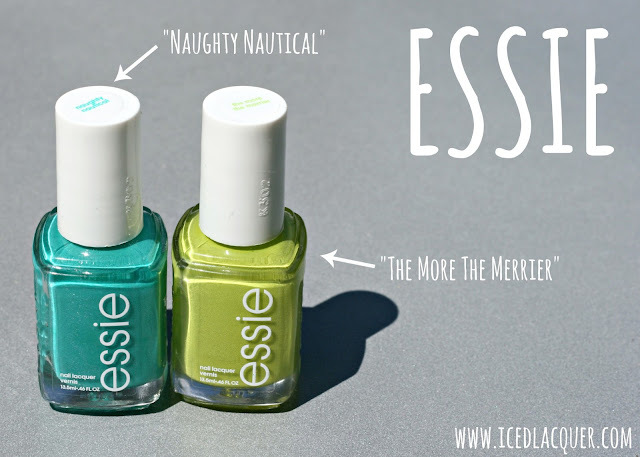 It's slightly darker than Naughty Nautical and has a green micro shimmer where the shimmer in Naughty Nautical is silver and slightly more flakie. I also feel that the shimmer stands out more in "S-teal a Base." Bottom right picture: Sinful Colors "Innocent" (on the swatch wheel, the Sinful Colors is on the left and the Essie is on the right) - This one looks like a pretty dang close dupe to me. The only difference I could tell is that "Innocent" has a tiny bit more yellow to it. They both have a great creme formula and provide excellent coverage in 2-ish coats. And that wraps things up for tonight! I hope you liked this length and informative comparison post. Hopefully my swatches can help you decide which shades and/or formulas you prefer! What do you think... would you like to see more of these types of posts in the future? Let me know in the comments!